Leave the steaks to rest at room temperature for half an hour before you start cooking. Heat the oven to 180C. Peel the carrots and chop along with the courgettes. Place the cherry tomatoes in the oven on a heat-proof tray. I use glass pyrex which is easy to clean. Meanwhile start making your polenta. Bring the vegetable stock to the boil and add the polenta in a slow stream, whisking continuously. Turn the heat right down and stir well, roughly every 4-5 minutes for approximately 30 minutes (you may need to add a little more water as you go). Once the polenta has been cooking for 15 minutes, you can bring a second pot of water to the boil to steam your vegetables. Season the steaks with salt and pepper and brush with half the ghee. Place a frying pan over high heat and when it is searing hot add the steaks, frying for 1 minute one each side. Brush the remaining ghee on the other side of the steak before you flip. Add the steaks to the tomato tray and cook for a final 5 minutes, for a medium rare steak. At the same time add the carrots and courgettes to the steamer, they will need approximately 10 minutes. 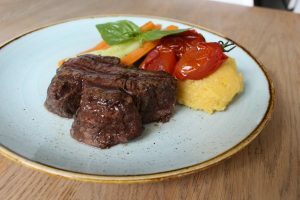 Leave the steak to rest for five minutes, while you finish cooking the polenta. Make sure you season it with salt and you can add in a knob of butter or parmesan if desired. Pour the juices from the tomato pan on top of the polenta – enjoy! Nutritional Note: Ghee has the highest smoke point of any fat so is perfect for frying steak and avoiding the harmful byproducts.